Uruguay’s marijuana economy isn’t what you may think. There are no coffee shops like there are in Amsterdam. There aren’t even dispensaries like there are in Colorado, California, or Oregon. Buying marijuana in Uruguay is actually quite difficult. And that’s somewhat of a surprise. You see, Uruguay was the first place in the world to legalize cannabis outright. Here, it’s legal to grow, sell, and consume marijuana. So naturally, a lot of people arrive in Uruguay with “high” expectations. They think they’ll be able to easily buy high-quality cannabis. But that’s not the case at all. 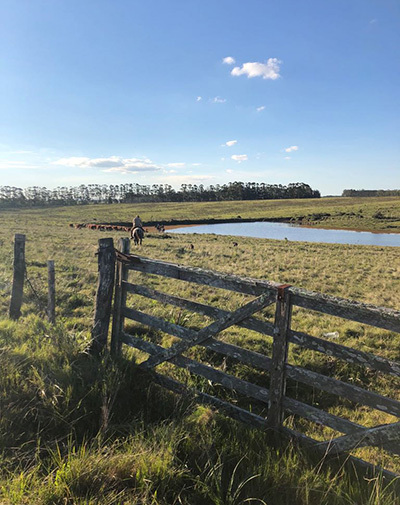 I went there to spend some time with Doug Casey, who lives on a gorgeous ranch about 30 minutes from Punta del Este. I also came to Uruguay to get a firsthand look at the country’s marijuana industry. So, I spent a day in Montevideo, Uruguay’s largest city and capital, before heading over to Doug’s ranch. 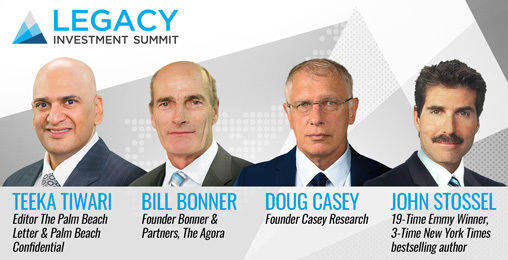 On October 17, 2018, all your favorite Casey Research editors will be flying into Bermuda for the largest conference we’ve ever held. The speaker list will include some of the greatest investors in the world covering the topics they know best. Plus, you’ll get to hear from John Stossel and special guest Glenn Beck. Register today and lock in the early bird pricing plus receive a $1,000 voucher to use toward any investment research service offered by us or our seven partner companies. Read all the event details here. There, I spoke with several locals about the country’s marijuana industry. One of those people, Mauricio, owns a cannabis shop in the heart of Ciudad Vieja, Montevideo’s historic center. But this wasn’t a dispensary. Again, they don’t have those in Uruguay. This was more of a paraphernalia shop. It sells bongs, rolling papers, and clothing made from hemp. Still, Mauricio was extremely knowledgeable about Uruguay’s marijuana industry. So, the two of us talked about the country’s market one afternoon. According to Mauricio, marijuana legalization in Uruguay isn’t the success that the government and many in the media claim it is. That might not seem so bad. But you must understand something. Less than two dozen pharmacies signed up to sell marijuana. And almost all of those pharmacies are located in Montevideo. So, it’s not that convenient to buy cannabis there. The good news is that marijuana is dirt cheap in Uruguay. A gram only costs about $2. That’s about one-fifth of what a gram costs in California. But that’s not the only problem with Uruguay’s marijuana industry. You also need to go into the government’s system to buy cannabis. In other words, Uruguayans must provide personal information—and even their fingerprints—to buy cannabis. A lot of Uruguayans aren’t comfortable doing this because they don’t know what the government will do with the information. So, they don’t bother buying cannabis legally. They do this so they can stay out of the government’s system, and because marijuana from the black market is apparently much better. In short, Uruguay’s legal marijuana industry isn’t the massive success that some people think it is. Of course, the program is only about a year old. It’s only natural that it would experience growing pains. 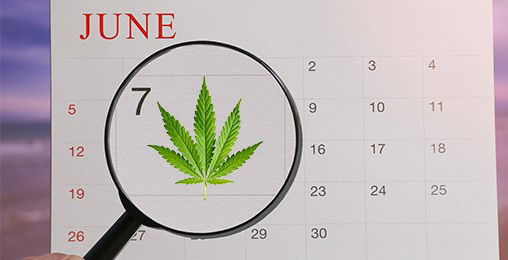 Investors have been waiting for June 7… when Canada will vote on legalizing recreational pot for the whole country. This is your chance to get in on the ground floor of the biggest pot stock boom in history. Here’s how to best play marijuana legalization… both in Canada and the U.S.
Uruguay’s new president, Tabaré Vázquez, isn’t a fan of marijuana legalization. That said, most locals I spoke with don’t think Vázquez will roll back legalization. But they also don’t think that he’ll do a lot to fix the country’s marijuana program. I’m telling you this because many marijuana investors believe there’s a huge opportunity in Uruguay. I even thought that I might find some interesting investing opportunities there. Instead, I left thinking that the Uruguayan government is throwing away a huge opportunity to create jobs, generate tax revenue, and attract tourists. The good news is that there are much better marijuana investing opportunities out there. I lived in San Francisco, California, and Denver, Colorado last summer. And, as you probably know, these two cities are at the forefront of America’s cannabis boom. But the best opportunity I’ve come across is north of the 49th parallel. Yes… I’m talking about Canada. You see, Canada’s government started the process of legalizing recreational marijuana in April 2017. Tomorrow, Canada’s Senate will hold a vote on legalizing marijuana outright. If everything goes according to plan, anyone over the age of 19 will soon be able to legally buy and consume marijuana in most parts of Canada. That includes tourists. And I can promise you this: Legalization in Canada will look a lot different than it does in Uruguay. Now, it’s not going to a completely free market. Those don’t exist anymore. There will be regulations. The Canadian government will take its cut of marijuana profits. But it won’t handicap the industry like Uruguay’s government has done. I’m not the only one who thinks this, either. Accounting firm Deloitte estimates that Canada’s marijuana market could become a $4 billion to $9 billion market once recreational use is legalized. Keep in mind, Canada’s marijuana market is currently estimated to be worth around $400 million. That alone is reason enough to invest in Canada’s marijuana economy. But it’s not the only reason. You see, Canadian marijuana companies are already exporting their marijuana, technology, and expertise all around the world. This puts them light-years ahead of the competition, including U.S. marijuana companies. So, consider buying Canadian marijuana companies if you haven’t yet. Just understand that marijuana stocks are still incredibly volatile. As always, don’t bet more money than you can afford to lose. Keep your position sizes small. And take profits as they come. P.S. Crisis Investing editor Nick Giambruno has three Canadian marijuana companies in his portfolio that are primed for a huge rally. If you’re interested, you’ll want to get in ahead of tomorrow’s important vote. It could be the biggest day in the history of pot profits. Click here to get all the details. So, Uruguay’s marijuana market wasn’t everything I thought it would be. But the country itself was unexpectedly beautiful. See for yourself. Here’s a picture that I took one morning from Doug’s backyard. The sunsets and sunrises are something else. 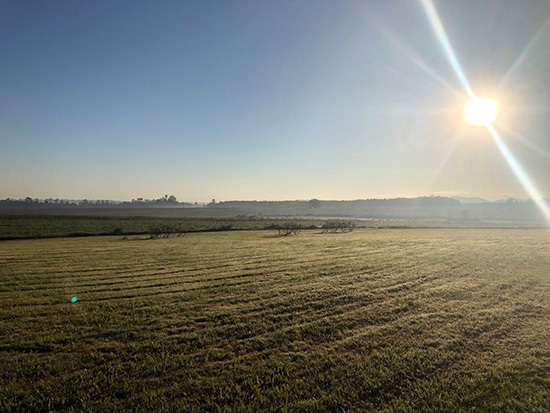 Here’s another one of the countryside near Doug’s place in Punta del Este. 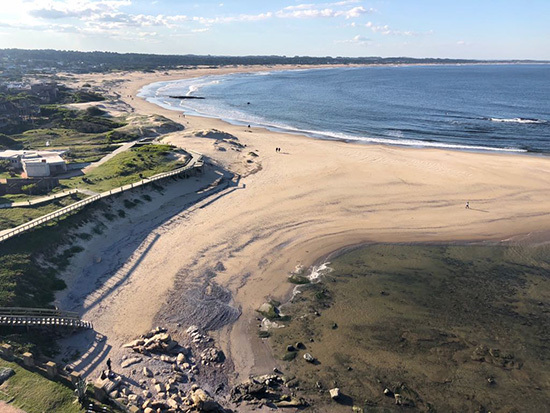 And finally, here’s a photograph of the beach in José Ignacio, an upscale beach town about 40 minutes from Punta del Este… Doug suggested I visit. It did not disappoint. The price of copper is on the rise. Since bottoming in mid-2015, prices have surged nearly 65%. This is in part due to demand from infrastructure projects like China’s New Silk Road. But it’s also because of the electric vehicle (EV) boom. A conventional gasoline car today requires around 50 pounds of copper. A fully battery-powered car, though, needs more than three times that amount. The copper demand isn’t just limited to what goes inside electric cars though. We need a whole new type of infrastructure to service these cars. This includes everything from power generation to charging stations, and even the power grid itself. That’s why research firm Wood Mackenzie believes that there will be a huge supply deficit in the coming decade. By 2028, the firm estimates that there will be a deficit of nearly 10 million metric tons of copper. 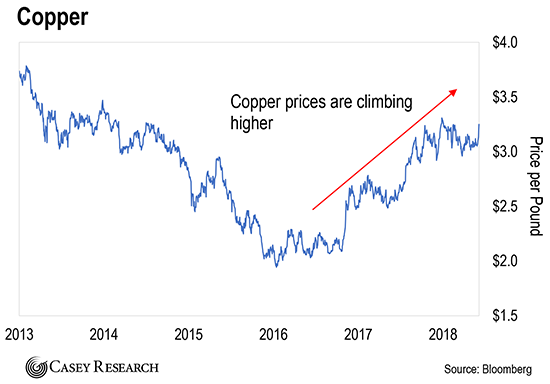 In the coming months and years, we expect copper prices to climb higher. We’re not alone. Investment bank Goldman Sachs sees copper prices rising nearly 15% this year alone. With the supply crunch looming, copper could reach new all-time highs in the next few years. P.S. Right now, we have two elite copper plays in our Strategic Investor portfolio. And copper isn’t the only metal we’re bullish on right now. We just released new research on the top metals—and more importantly, the specific companies—set to boom in the years ahead. It all has to do with the massive power shift that’s currently underway… And you can get all the details right here. I’d like you to address the bitcoin selling point of the limited supply of 21 million. It’s my understanding that at any time a lesser than 50% majority of holders and miners can vote to expand the supply. You forgot to answer the most important question of all: Where can I spend my bitcoins? There is no intrinsic value in Bitcoin any more than there was intrinsic value in cowrie shells for the South Sea Islanders or in gold, for that matter. Each is valuable because we place an arbitrary value on its rarity and use it as a medium of exchange. No intrinsic value at all. Nor need there be.